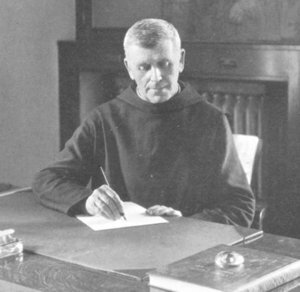 Dies Natalis of Father Lukas Etlin, O.S.B. December 16th, is the dies natalis (heavenly birthday) of the Servant of God, Father Lukas Etlin, O.S.B., a monk of Conception Abbey. In 2008 I made a novena to Father Lukas beginning on November 16th. On the evening of the feast of the Immaculate Conception, 8 December 2008, I was given a picture of Father Lukas. I slipped it into the pocket of my habit before driving home. Less than fifteen minutes later I was the astonished and grateful survivor of a terrible automobile crash. No bumps, bruises, scratches, aches, or pains. Let nothing frighten or grieve you, let not your heart be disturbed, do not fear any sickness or anguish. Am I not here, who am your Mother. Know for certain, littlest of my sons, that I am the perfect and perpetual Virgin Mary, Mother of the true God through whom everything lives, the Lord of all things near and far, the Master of Heaven and Earth. I wish and intensely desire that in this place my sanctuary be erected. Here I will demonstrate, I will exhibit, I will give all my love, my compassion, my help and my protection to the people. I am your merciful Mother, the merciful Mother of all of you who live united in this land, and of all mankind, of all those who love me, of those who cry to me, those who seek me, of those who have confidence in me. 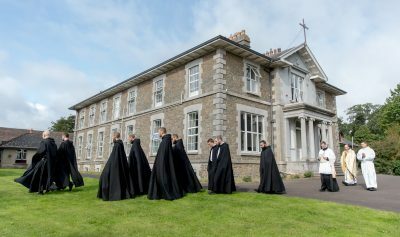 The feast of Saint Fionán (Finnian) (470–549), kept on December 12th, holds a special significance for the monks of Silverstream Priory, not only because Saint Finnian is the patron of the Diocese of Meath, but also because he walked the Boyne Valley in which our own monastery is implanted. Saint Finnian was a contemporary of Saint Benedict (480–547), thus establishing a link in time between Clonard (founded in 520) and Monte Cassino (founded in 529). Our own Dom Finnian, being a native son of the Diocese of Meath, was named for its glorious patron. The monasticism established by Saint Finnian would have much in common with that established by Saint Pachomius (292–348) in Egypt. Pachomian monasticism was characterized by vast villages of monks divided into households according to the trades or crafts exercised by the monks. Saint Finnian’s monks too, in addition to their distinctive commitment to learning and education, would have exercised all the trades and crafts needed to build and maintain their community.